A roof is more than just tiles, flashing, and chimneys: an integral part of any roof system is the roofline, sometimes referred to as the fascia board. This is the part of the house that connects the roof to the rest of the building, and it has a number of important uses. At A P Benson Roofing & Building , we have been providing essential soffit and fascia installations and repairs to clients across Surrey for almost forty years, including Guildford, Woking, Chobham, Farnham, and Godalming. The roofline runs around the edge of the roof, connecting it to the main building of a premises, and is made up of four main parts: the fascia, the soffit, the bargeboard, and the box end. Guttering on your home is in place to protect the foundations of your property, it works by diverting rain water away to the drains. Failure to maintain or repair guttering can lead to significant problems both internally and externally. Sagging gutters, missing brackets or fixings causing the weight of the water , in the gutter to sag,leaking on to external walls causing damp and structural issues. Increase the value of your home by fitting new guttering to form effective drainage of rainwater from the building protecting your home from rain and damp, while improving the look of your home. 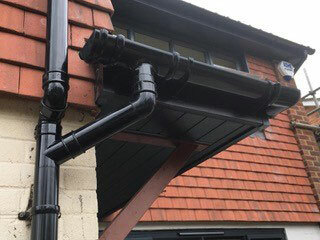 We have over 30 years’ experience of removing Finlock concrete gutters by our qualified fitters, transforming damp bedroom walls due to water seepage behind the deteriorating concrete gutters and replacing with brand new UVPC guttering giving the outside of your property a totally fresh new appearance, complimenting your home with an aesthetically pleasing finish and diminishing damp problems. This is the long board running down the lowest edge of your roof. It’s gives essential support to the structure of the roof, holding up the lower edges of the bottom roof tiles, as well as carrying the guttering. Soffits and fascias work alongside one another. 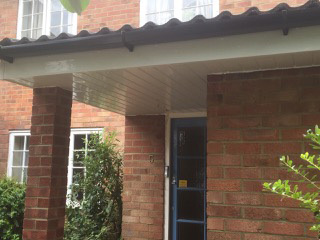 Installed below the fascia board, the soffit provides extra support and can be used to admit ventilation to the roof. 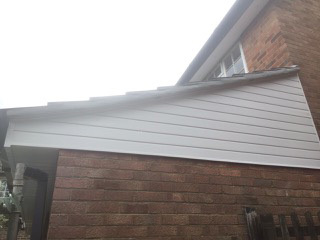 While the soffits and fascias run the length of a property, the bargeboard is fitted at the gable end, securing the soffit and fascia on either side of the house. This is essentially where the bargeboards, soffits and fascias all meet at the corner of a property, and is specially shaped to accommodate the various angles, planes, and heights involved. A gutter is a shallow trough fixed beneath the edge of a roof for carrying off rainwater. 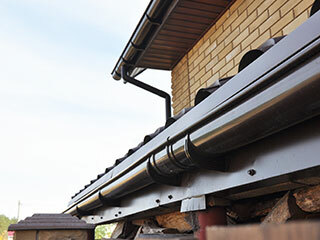 A pipe to carry rainwater from a roof gutter to a drain or to ground level. Why is the roofline so important? Not only does it make the edge of the roof more attractive, the roofline provides much needed structural support, as well as providing protection against bad weather, and allowing ventilation to the roof that can prevent the setting in of rot. Working from our Guildford office, our professional roofers deliver bespoke soffits and fascias across Surrey, including our valued clients in Woking, Chobham, Godalming and Farnham. For over forty years, we have been providing high quality soffit and fascia installations and repairs across the Surrey area. Our team of roofers have over a century of on-the-job experience between them, meaning you can relax in the knowledge of a job well done. 01483 760 444 for a free personal quote.